The late 1980s and early 1990s were a crazy time for the Japanese car industry and for sports cars in particular, with some of the most memorable designs to ever come out of the country before or since introduced from 1985-95. One solid contender for the greatest of all of them is the Mark IV Supra, also known as the A80. While the Supra started as a car based largely on the Celica, it had developed into its own distinct model and by the time of the A80’s unveiling at the 1993 Chicago Auto Show, Toyota had gotten ambitious. 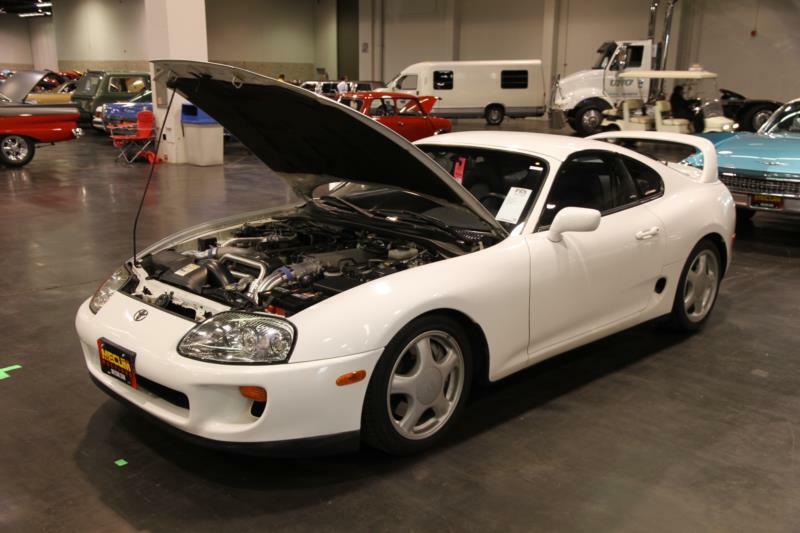 Toyota had trimmed 100kg off of the third generation car, and while based on the same platform as the Lexus SC, the Supra was still 13 inches shorter. It was also lighter than the rival 300ZX Twin Turbo and Mitsubishi 3000GT VR-4, and had double wishbone and multilink suspension, with turbocharged models fitted with a limited-slip differential and electronic traction control. The A80 also has remarkable brakes, with a four-sensor ABS system with yaw control that helps the Supra Turbo brake from 70-0 mph in 149 ft. The most famous ingredient of the A80 Toyota Supra, though, was its engine –the JZ-series straight-six. Eminently tunable, it’s a unit that people have gotten over 2,000 hp out of, and even 700 hp is apparently possible without having to open up the bottom end. In stock naturally aspirated form, the engine made 220 hp. The twin turbo model, meanwhile, made 326 hp and came with a 6-speed Getrag manual, although a four-speed automatic with manual shift mode was an option. Peak torque came all the way from 1,300 to 4,500 rpm. 0-60 for turbocharged models came in about five seconds, and top speed was a limited 155 mph. Supras were raced all over the world from Pikes Peak to Le Mans, and won championships in the Japanese Grand Touring Championship (JGTC) in 1991, 2001, 2002 and 2005. It’s also an icon of tuner culture. When it came out, the Supra was also one of the best looking new cars out there, not just from Japan but from anywhere. Turbo models also came standard with a rear-spoiler and, from 1996, a targa roof. 1997 models got a restyled front bumper and headlights, and 1998 got a restyled interior with three-spoke steering wheel. Unfortunately, the Supra suffered from the same problem as all of the high-end Japanese performance cars in the 1990s. Unfavorable exchange rates saw prices skyrocket while the cars largely remained the same. In only its first few years it had gone from $30,000 to $50,000. At least Honda’s NSX had a premium Acura badge on it. For many people $50,000 for a Toyota, no matter how fast and advanced, was hard to justify. Sales fell, and the Supra was gone from the Canadian market in 1996 and the U.S. market in 1998. All production ceased in 2002. The A80 Toyota Supra Twin Turbo is arguably the definitive Japanese performance car of its decade, and for that alone it is highly collectible. It has also been a highly popular tuner car, though, so many of them have been highly modified. Plenty have been crashed as well. A good, unmolested, low mileage example is therefore hard to come by, and these cars are considerably more desirable than cars with a checkered history.